Greece is a popular destination for its impressive history, wonderful culture, delicious cuisine, and, of course, its world renowned nightlife. 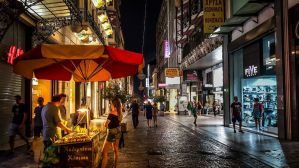 If you're headed to Athens or the Greek Isles to take advantage of this nightlife, any of these hostels will serve as an excellent jumping off point. Whether you're looking to meet fellow travelers or find a social bar, these hostels are a great place to start. How much do hostels in Athens cost? 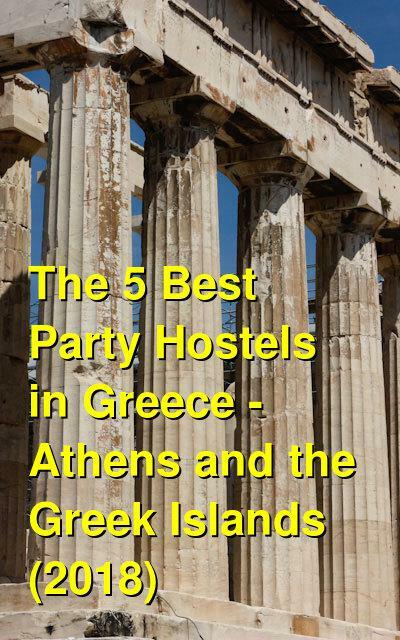 What are the best party hostels in Athens, Corfu, Santorini, and Ios? This Australian owned hostel is a favorite among travelers to Athens. It's located conveniently right in the heart of classical Athens and is in a safe and comfortable area. The hostel often has events and activities for guests which range from quiz nights to karaoke nights and twice a week they have live music. There's also a daily happy hour and regular walking tours of the city. There are a range of room types such as dorms and private apartments. Complimentary breakfast is provided. The staff is very knowledgeable and friendly, and will be eager to help you with any questions you may have. The reception is open 24 hours a day and you can check in at any time that is convenient for you. The on site bar is highly recommended as it is a great place to meet fellow travelers. SmallFunnyWorld offers: unique themed rooms, a fun rooftop, delightful free breakfast, and much more. The property is located only steps away from Monastiraki metro station, with a direct connection to the airport and the port of Athens (Piraeus). You will also be able to reach Acropolis or the Greek Parliament Square within a 10 minutes' walk. You are in the heart of the hottest nightlife in town, with the nearest bars only meters away. The hostel is a multi-cultural space, where different civilizations blend in together, they have four main floors: the Latin, the Far East, the Oriental, and the African floor. In the SmallFunnyLobby you can take a break and let the Greek element welcome you with the nautical fie decor and warm hospitable spirit, and you can also enjoy its secret Acropolis view. Self-Catering facilities are available and there is an elevator at the facility. The property has a 24 hour front-desk, free Wi-Fi, and free maps and tourist information available. Towels and linen are included with your stay. Customers must be 18 and over. The Pink Palace has been a favorite destination and meeting point for Greek Island hopping backpackers for many years. It is the friendly and helpful staff, low prices, long happy hours, beach front rooms with spectacular sea views, mild weather even during winter months, and the international atmosphere that makes The Pink Palace an all year round delightful destination in Europe for students, backpackers and holiday makers of all ages and nationalities. Whether you're into swimming, lounging by the pool and beach, tanning while reading a good book, kayaking, snorkeling, cliff diving, fishing, hiking, nature walks, touring historical villages and ancient castles, partying with other travelers, meeting other people and making worldwide friends, taking it easy by the crystal blue Ionian Sea, enjoying the best sunsets, or experiencing Greek culture, history and fine cuisine, The Pink Palace has it all and much more all year round. They have a variety of accommodation starting from dorm rooms to 2 Star hotel rooms in Singles, Doubles, Twins, Triples, Quads and larger. Most rooms are complete with private shower and bathroom en-suite, balcony with breath-taking sea views, private phone lines, air-conditioning, and hair dryers. Daily activities are available to help you enjoy the best of the surrounding area such as: 4-wheeler safari's, boat trips and booze cruises, hiking, city tours, toga parties, snorkeling, kayaking, and more. There is an on-site night club and bar where guests receive free entry and you can party the night away. Free airport transfer, breakfast, parking, Wi-Fi, linen, and towels are included with your stay. The Far Out Beach Club is a backpacker's paradise, located right on Mylopotas beach, offering a variety of accommodation for all budgets and requirements. It is the hottest spot on Ios offering top facilities and a nonstop link to crazy happenings in the area. The Far Out Village pool bar and restaurant is an excellent place to enjoy the Aegean sunset in a relaxed atmosphere. If you prefer to dance to the sunset, head next door to the bars and pools at Far Out Camping where the music never stops. Accommodation available to book on this site are en-suite rooms/suites and windmill shaped bungalows. With pool competitions, tennis, volleyball, basketball, cinema, and cybercafe with access point, there are plenty of things to do in the hours between beach and going out at night.When you need a break from Far Out just jump on any of the buses right outside. Free transfer is available from the ferry terminal. The Far Out Beach Club is a party zone for backpackers. Free city maps, parking, Wi-Fi, and linen are included. Fira backpackers is a budget place with private rooms and dorms at the downtown area of Fira, the capital of Santorini Island. The property provides cheap accommodation in a stylish place with all the facilities of a hotel. The property is less than 100 meters from everything you need to make your stay comfortable and enjoyable, such as: the main bus station of Santorini, the main square of Fira town, the Caldera cliffs for shopping and sunset views, banks, travel agencies, museums, bars/clubs, restaurants, hospital, and supermarket. All private rooms have a bath, balcony, fridge, and air-conditioning. The private rooms are cleaned daily, new towels every second day and new sheets every third day. All dorm rooms have a bath, luggage lockers, air conditioning, and fridge. The dorm rooms are cleaned daily, new towels and sheets every third day. The facilities include: Wi-Fi , communal kitchen use, the use of a washing machine, internet corner, daily cleaning service in private rooms and dorms, 24 hours hot water, living room with big screen for sports and movies, hair dryer, iron and board. The facility can also arrange private or shared transfers, car and motor rentals, and tours around the island.